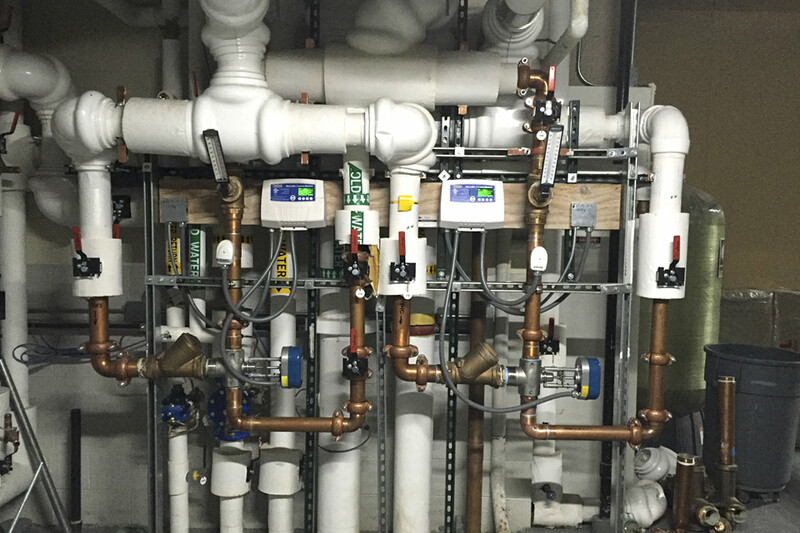 Two MetroMix Temperature Controllers installed on a hot water system in the basement of the Langham, Chicago hotel. The notion that, “Change is the only constant,” applies to basically everything, including our water. Between a growing population, aging infrastructure, and efforts to improve water supply and delivery, municipalities around the country are changing water treatment methods and these changes may necessitate equipment changes. Broadly speaking, changes to our water in the way of chemical treatment is leading to faster scaling, damaged valves and an increase in the need for maintenance on some equipment. Of course, with increased maintenance comes increased costs and that is likely a sign that it is time to change more than the maintenance schedule. The Langham, Chicago – one of only four Forbes Five-Star Hotels in the city – recently found itself in this exact position and recognized the need for change. As a property that prides itself on offering exquisite accommodations and service, The Langham needs everything – both front and back of house – to work flawlessly and the hotel’s pair of thermostatic valves, for domestic hot water temperature control, were proving unreliable for the more than 300 guest rooms. In short, regular use of the system was leading to frequent maintenance (approximately every six months) and the costs associated with these rebuilds/replacements were mounting. Though thermostatic mixing valves have been a mainstay in the plumbing industry, the design of these devices often makes them unable to handle today’s evolving demands and water characteristics, especially on a larger scale. Fortunately, electronic mixing valves are an emerging industry option proving to be a contemporary and reliable replacement to the legacy thermostatic valves, and Metropolitan’s MetroMix Stainless Steel Electronic Mixing Valve is a premier example. After meeting with both the plumbing contractor and the chief engineer at The Langham, Metropolitan engineers determined the failing system could be drastically improved if the dated thermostatic valves were removed altogether and replaced with a reliable MetroMix system. In many ways, this retrofit was standard, despite being different from our double-valve preferred piping schematic, but there was one distinct difference: The water had to remain on. After all, it is hard for a luxury hotel to offer luxury without water for hours on end. To allow for “on the fly” installation that was seamless for guests, we added one MetroMix Temperature Controller to each valve. Finally, two independent MetroMix Temperature Sensors were installed to ensure that our uniquely tight temperature parameters remain steady at all times. However, reliable water temperature is only one of the benefits. In addition to allowing the hotel to seamlessly upgrade to more advanced technology, electronic mixing valves offer two distinct benefits that can lead to cost savings and a more rapid return on investment. Rather than being hindered by inherent design limitations, electronic valves are built to regulate temperature with greater precision than their thermostatic counterparts. The MetroMix in particular uses a modulating, motorized stainless steel valve which, when paired with our temperature sensors, helps to maintain a temperature that is accurate within 1-2 ºF. This accuracy offers a consistent experience and more efficient performance (i.e. cost savings becomes a natural byproduct) without any adverse affects to the overall system. Thermostatic mixing valves, by design, have a large pressure drop across the valve that reduces flow rate capacity, but the MetroMix valve is a full-ported globe style mixing valve. This design often allows us to supply a smaller body size MetroMix when compared to the existing thermostatic mixing valve. In fact, as was the case at The Langham, we were able to provide a 2.5” national pipe thread (NPT) in lieu of the existing 3” NPT thermostatic mixing valve while still meeting the flow requirements of the hotel. These benefits make for a more reliable system overall, but the connected nature of every MetroMix system is what really gets you out of hot water (metaphorically speaking, of course). Even a quality hot water system can be found lacking if it is cumbersome to maintain and monitor. Our MetroMix valves overcome this potential downfall by integrating important safeguards. In addition to enabling the activation of an auto-shutoff if critical temperature is reached, the system allows our temperature precision to be monitored and controlled through a building’s automation system. Alarm notification is achieved via the standard design of the MetroMix controller incorporating dry contact alarms and an alarm relay, which can be used to actuate a safety valve in, for example, an alarm condition. The controller can easily connect to a building automation system (BAS) via an optional Building Automation and Control Network (BACnet) module to communicate multiple pieces of vital data seamlessly to the BAS. This connection – not possible with thermostatic valves – allows maintenance to be informed of an abnormal situation as quickly as possible. Today, more than a year after the installation of our MetroMix system, The Langham has not needed any servicing, a notable break from its previously needy thermostatic operation. We call that a success. And the 300 plus guest rooms pumping out water at the perfect temperature seem to back our claim. To learn more about the MetroMix and how it might be the solution for your building application, call or email Mike Temes at 815-886-9200 or mtemes@metropolitanind.com.